Following a successful fundraising initiative late in 2016, we’ve been inundated with requests from other people wanting a space on the Dedication Wall in the Sixth Form Centre at EGS. Please use the form below to purchase a space on an additional panel that will be added to the wall soon. 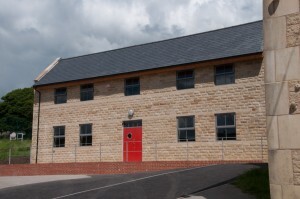 Work began in Autumn 2015 on the new Sixth Form Centre at Ermysted’s Grammar School, located on the site of the old school canteen, just below ‘The Top’ and next to the Sports Hall. It features new classrooms as well as dedicated study areas with Wi-Fi access. The facility began being used in September 2016. Increasingly, Ermysted’s is having to compete against other schools and colleges and our overcrowded facilities didn’t provide anywhere away from the hustle and bustle of the rest of the school for those choosing to stay on for Sixth Form, or move here from another school. Our Voluntary Aided status means we had to pay the first 10% of any construction work. The total cost of the project was £550,000, so we have had to find £55,000 of that through fundraising. 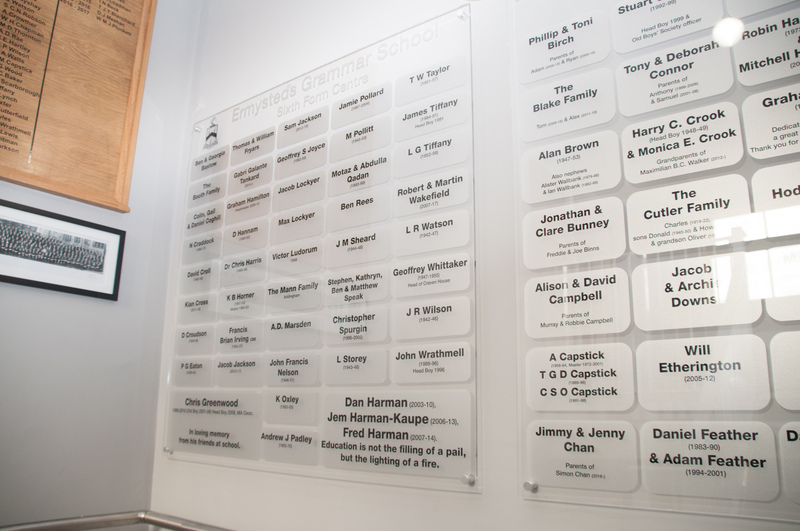 After the success of our initial fundraising initiative, we’ve re-opened the purchase of spaces on the Dedication Wall – a new panel will be put up in the staircase area of the Sixth Form Centre alongside the main dedication wall which was unveiled in December 2016. 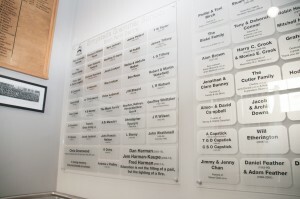 The Dedication Wall features the names of individuals and families who have contributed financially to the project. Old Boys, parents, governors, boys, staff and friends of the school are all welcome to purchase a panel to show their support. There are two options for purchasing a space on the dedication wall. Click the image to see a larger version of what the panels look like. Please use the form below to request a space on the dedication wall. Once you click ‘complete payment’ you will be transferred to PayPal to make a payment for your purchase. Thank you very much for your support of this really important project. If you have any questions regarding panel sizes, wording or special requests please contact us. Thank you for supporting the Sixth Form Centre project. Please select the dedication wall option below that you would like to purchase. The total payable will update in the blue box on the right. Once you have made your selections, click 'Complete payment' to be taken through to the PayPal payment page. Here you will be able to pay by debit or credit card, or using your PayPal account if you have one (not required). I would like the school to obtain the tax benefit of my purchase from the charity. What is 7+5? * Please enter your answer to the sum shown above. This is to prove you're human and not a robot.